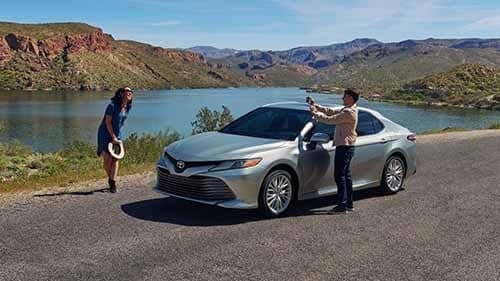 Redesigned this year, the 2018 Toyota Camry is turning a lot of heads from Miami all the way to Fort Lauderdale thanks to its long-lasting reliability, dynamic new exterior design and confident performance capabilities. Here, we’ll look at some of the features found throughout the new Camry trim lineup, including the latest Entune® infotainment features. When you’re ready for a closer look, Miami drivers can browse the following Camry trims here at Toyota of North Miami. Like all Camry trims, the LE comes with the Toyota Safety Sense™ P package and an Entune™ 3.0 infotainment interface. You’ll also get an efficient 2.5L inline-four engine and a power adjustable driver’s seat. The SE trim adds a number of performance elements to the mix, including more rigid suspension tuning and a rear spoiler, as well as SofTex leatherette upholstery and 18-inch black-machined alloy wheels. The XLE tacks on a number of premium creature comforts, including leather upholstery, heated front seats, a HomeLink® system, and dual-zone automatic climate control. The Camry XSE includes many of the XLE’s features while shifting the focus back to performance with a sport-tuned suspension and paddle shifters, as well as a dual-exhaust system. Bookending the Toyota Camry trim lineup are the Toyota Camry L on one end and the XLE V6 and XSE V6 on the other. The L base trim is the most affordable model with an MSRP from just $23,495*, and it comes with features like the TSS-P package and the Entune™ 3.0 Audio with Connected Navigation and App Suite. The XLE V6 and XSE V6 boost output with a 3.5L V6 engine that makes 301 hp, while boasting other premium features like a panoramic glass roof, smartphone charging station, and a JBL® w/Clari-Fi sound system. For Hollywood, FL drivers looking to buy the all-new Toyota Camry, we invite you to make your way to Toyota of North Miami. In addition to our convenient location at 16600 NW 2nd Ave in Miami, there are lots of reasons to shop with us, including our complimentary car washes and inventory of over 1,000 models! Here you can also work with the experts in our finance center to find a payment plan that works for you. Schedule your test drive of the Camry by contacting us, and feel free to ask us any questions, like how to turn off the maintenance light! And be sure to follow the Camry maintenance schedule to keep your sedan running like new!